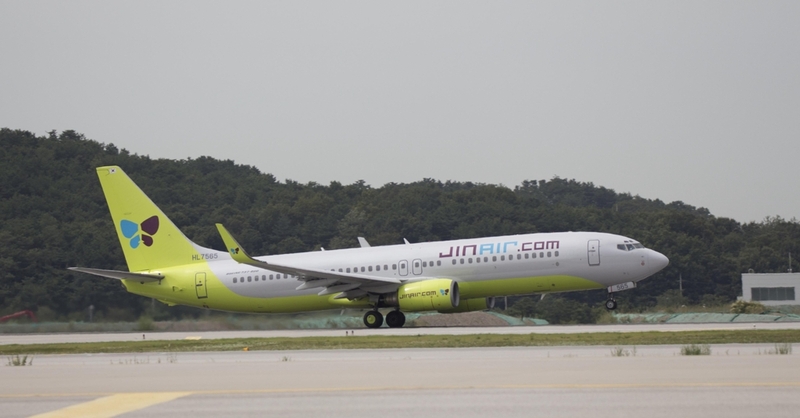 SEOUL, Aug. 10 (Yonhap) -- Jin Air Co., the budget affiliate of Korean Air Lines Co., said Friday that its second-quarter net profit fell 88 percent from a year earlier on increased fuel costs and decline in travel demand. Net profit for the three months that ended on June 30 came to 1 billion won (US$886,000), down from 8.1 billion won a year earlier, the company said in a regulatory filing. Operating profit dropped 50 percent to 6.2 billion won in the second quarter from 12.5 billion won a year ago. Meanwhile, sales rose 18 percent on-year to 226.5 billion won. The earnings results came as the South Korean government has been mulling whether to cancel the airline's license for its illegal appointment of a foreign national to its board of directors. Under South Korean aviation law, only South Koreans can be registered as a director of an airline. Jin Air named Cho Hyun-min -- a younger daughter of Korean Air Chairman Cho Yang-ho -- as its director between 2010 and 2016, even though she is legally an American citizen.